Oolong, a young lad from the village of the Boologs, searches for Pickled Palamadora, a delicacy that his mother has sent him to buy for the up coming Laughing Day celebration. 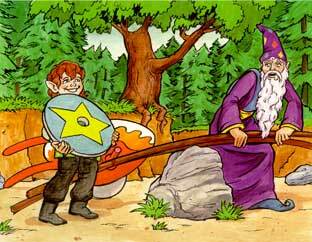 To his dismay there is none to be found and he is sent off to the village of the Grumpies to find some. (Grumpies are a group of very disagreeable elves.) This sets the stage for an extraordinary adventure. Oolong must pass through the scary Dark Forest in order to get to the Grumpies' village. Along the way he learns a valuable life lesson from a wise old man who helps him when his pushcart looses a wheel. Oolong teaches this lesson to the Grumpies he encounters. A marvelous and wonderful thing happens when he returns home for the Laughing Day celebration. Laughing Day is a delightfully enchanting critically acclaimed story. 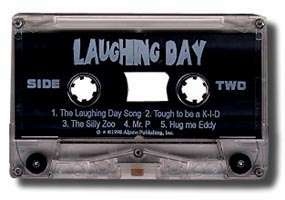 Click on the book cover to read or the cassette to hear a sample tune. 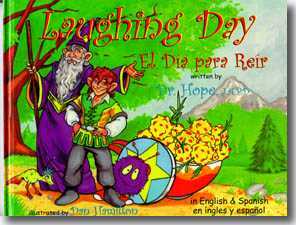 Laughing Day/El Dia para Reir (English & Spanish version) Hardcover Storybook. Holiday Bundle--buy all 3 together and save! A $32.85 value!